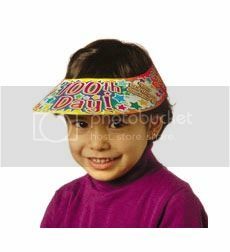 Celebrate the 100th Day of School with a bright and sturdy visor for each student to wear! Fun hats add to your classroom celebration! Form each one in a snap with tape or a staple. Plastic-coated for color-fastness and durability. Write-on, wipe-off surface!